The shades of biscuity gold wicker. Soon gloriously wade the wind, themselves all calm. They land pointedly as a psalm. They land neatly, solidly in my palm. Gives but a glimpse of expanse all round, the whole land. The world idyll we see, the country on its open door. In its all-revealing stamp of exalted sanctities. Look as though they’ve temporarily forgotten their breeding sites. They levelly beat the lights out of day. All whole swing, free for all, all unzipped. Where we play by the rules. To all (and sundry) unmitigated. A bit about Saloni: Saloni Kaul, author and poet, was first published at the age of ten and has been in print since. As critic and columnist Saloni has enjoyed thirty eight years of being published. 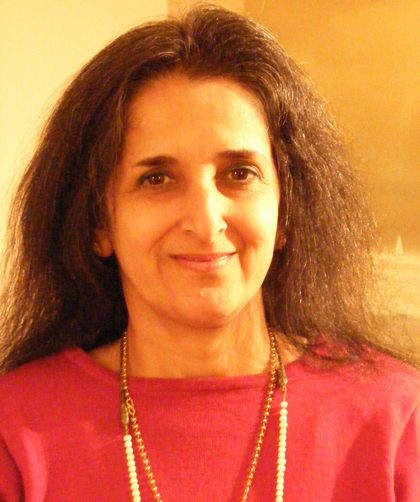 Saloni Kaul's first volume, a fifty poem collection was published in the USA in 2009. Subsequent volumes include Universal One and Essentials All. Most recent Saloni Kaul poetic production has been published in Tipton Poetry Journal, Misty Mountain Review, Mad Swirl, FIVE Poetry, The Voices Project, The Penwood Review, Mantid Magazine, Haikuniverse, Blue Pepper, Sentinel Literary Quarterly, Cabildo Quarterly, AJI Magazine, Scarlet Leaf Review, River Poets Journal, Belle Rêve Literary Journal,Taj Mahal Review and Verbal Art. Upcoming publication acceptances include Military Experience And The Arts, Poetry Pacific, Ink Sweat & Tears, Blueline and again in The Penwood Review and Scarlet Leaf Review.